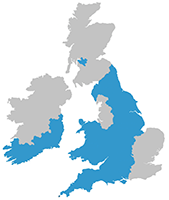 The CRANE database is a national register that was established in 2000 to collect information on children born with a cleft lip and/or palate in England, Wales and Northern Ireland. The database collects birth, demographic and cleft diagnosis information. It also collects information about cleft-related treatment and outcomes. These outcomes include dental health, height and weight and speech. There are 15 administrative cleft units, operating across 10 regional centres or managed clinical networks, that submit data electronically to the CRANE database. The database is housed at the Royal College of Surgeons of England and is funded by the National Specialised Commissioning Group for England and the Wales Specialised Health Services Committee. An independent body, the Cleft Development group, made up of patient representatives, clinicians and commissioners, has the overall responsibility for the database.